ComPilot provides versatile, StereoSound Bluetooth connectivity for easy wireless access to TVs, MP3 players, phones or an FM system, to name but a few. Streaming time has increased to an amazing 8 hours or more of continuous, robust wireless transmission. The replaceable neckloop, now available in 2 lengths, means wearers will always have ComPilot right where they need it. It guarantees proper placement for stable streaming, best voice quality for phoning and keeps hands free. ComPilot is ideal for enjoyable phone conversations for all. To guarantee excellent sound quality for the call partner, ComPilot uniquely employs a dual microphone system, enhancing voice pickup, especially for calls in noisy environments. If the ComPilot is worn under clothing, there is also the option of an external microphone for improved call quality. ComPilot is compatible with virtually all Bluetooth enabled or adapted mobile and landline telephones. When coupled with the Phonak TVLink S, the ComPilot offers an unrivalled listening experience. The extremely fast transmission from TV to hearing instruments combined with StereoSound provides excellent sound quality. Plus, true ‘plug & play’ and a one-step set-up mean that the TVLink S is ready to go in less than 60 seconds. 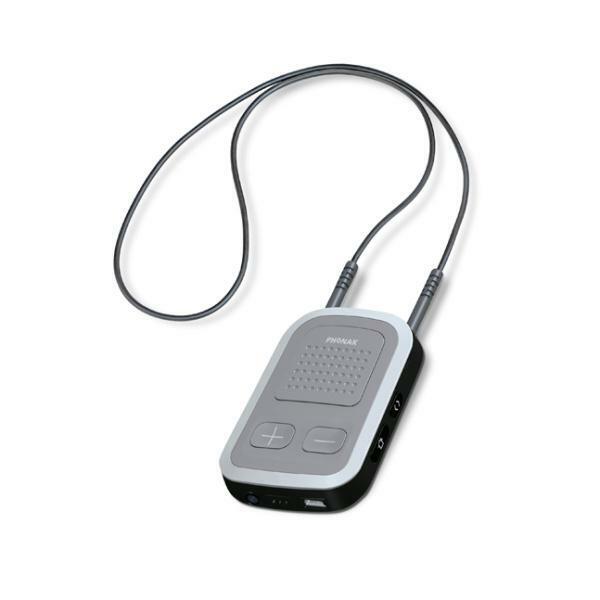 The Phonak ComPilot II is compatible with Phonak Venture Wireless Hearing Aids such as the Phonak Audeo V and the Phonak Bolero V.